Like any industry, commercial roofing trends emerge with advancements in materials and construction, changes in public attitude, and the needs of the people. It’s great to be on trend, but it’s also important to understand the drawbacks and limitations of these trends — before signing on to something that might damage or detract from your commercial roof. Let’s examine some commercial roofing trends and the often overlooked factors that might make this trend one to avoid for your particular roof. It seems like every time you turn around, another commercial building is getting retrofitted with solar panels. Everyone from environmentalists to frugal building owners are installing solar panels on their roof to help power their properties off the traditional grid. With the latest advances in technology, it’s easy to get swept up in the promise of reduced electricity costs and an eco-friendly solution. Installing solar panels on a roof is a logical way to save money and guard against power grid disaster. However, if those panels are not installed properly, it can lead to major spending issues on a micro level, namely, roof performance and maintenance. 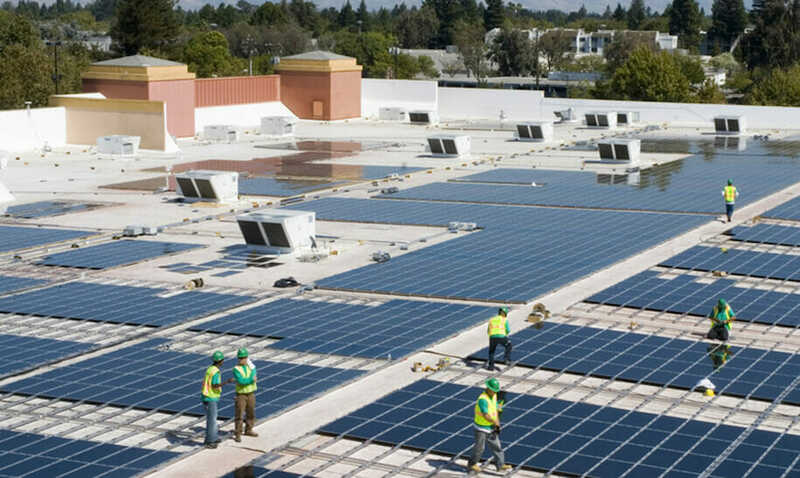 It is common for solar equipment to be placed directly on the roof membrane and anchored to the building, which can mean cutting into the roof membrane. If installation is not performed correctly, it can cause damage to the roof and can void materials warranties. Even if the installation is done properly, there can still be expensive trouble down the line. When (not if) leaks or damage occur to the roof, those panels must be moved in order to properly address and fix the problem. In many cases, moving solar panels around can be more costly than locating and repairing the leak itself. Green, vegetative roofs are becoming extremely popular, especially in urban areas. They contribute to the energy efficiency of the building, insulate sound, reduce stormwater runoff, and turn neglected space into usable, green space benefitting the building owner, the tenants, and the community at large. They are hugely popular with environmentalists and architects alike. Not only are they aesthetically pleasing, they can help to drastically reduce the building’s cooling costs. There are numerous positives to green roofing systems, but there is one very important consideration that many building owners overlook. Green roofs are continually exposed to water. Plants need water to grow, and soil must be kept moist. It is absolutely critical that green roof installers strictly adhere to basic waterproofing principles, as one mistake or oversight could lead to major problems sooner rather than later. It is also important to remember that if the roof membrane beneath the vegetation and soil does experience problems, repair teams will have to get under all of those layers to isolate the issue, identify it, and repair it — this can add time and expense to the repair work. With green roofs, preventative maintenance is of the utmost importance. Smaller upfront investments for ongoing maintenance are necessary to prevent costly problems down the line. Whether their motivation is environmental or cost-savings, nearly every building owner is concerned with being more energy efficient these days. There have been major advancements in insulation, and a trend in the commercial roofing industry is high-performance insulation, including high-density coverboards that insulate the building and are more resistant to “crushing” under high foot traffic. High-performance insulation is an absolute must in order to maintain energy efficiency in a modern building. Heating and cooling systems are calibrated based on the R-value of the chosen insulation. Unfortunately, many advertised R-values are incorrect, which means that the engineers who calibrate the heating and cooling system will base their settings on the wrong data. Even if you have the correct R-value, your insulation could cost you. In the event of a leak – even a small leak, if the insulation experiences extensive water damage, it will need to be replaced. Replacing high-density, high-performance insulation can sometimes be more expensive than fixing or replacing the roof membrane itself. Known as “cool roofs”, white or reflective roofing systems are ideal in warm months or climates. Standard, black roofs can reach temperatures over 150°F in the summer. A white or reflective roof in the same the same conditions can be up to 50°F cooler, reducing cooling costs. However, in areas that experience cold winters, the benefits of black roofs can actually outweigh those of white roofs by keeping buildings warm and reducing heating costs. Northern building owners need to consider their environmental conditions and exposures before jumping onto the white-roof bandwagon. Trends: Avoid Them or Consider Them? Trends rise in popularity for one reason: they offer some sort of benefit that is tempting for building owners. But, like almost everything in the commercial roofing world, one size never fits all. How the benefits and drawbacks of these trends will affect you depends entirely on the unique aspects of your roof: the materials, the building’s purpose, the region in which it is situated, etc. Being able to evaluate trends with a critical eye and examine them in the context of your unique needs is critical for strong decision making when it comes to roof construction or replacement. If you do decide to pursue some of these trends, make sure to anticipate the potential issues and budget properly for long-term maintenance and repair for your chosen roof system.